Gurgaon: Medanta Medicity, one of India’s largest multi-super specialty institutes located in Gurgaon announced the launch of FemtoLASIK, a revolutionary technology and the most advanced LASIK treatment available in the world that enables bladeless refractive treatment. FemtoLASIK technology is the most advanced procedure aimed at improving patient’s quality of life by reducing the dependence on glasses. 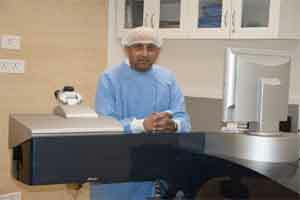 This world renowned LASIK technology is the current state-of-the-art in refractive surgery. It works by altering the shape of the cornea to treat nearsightedness, farsightedness and astigmatism. “With this launch, the Institute of Ophthalmology at Medanta is at par with other renowned medical institutions globally.” Dr. Pakrasi added.